NYC Educator: Who's Afraid of Matt Damon? It's amazing watching reformy people fall all over themselves to condemn actor Matt Damon for sending his kid to a private school. They claim to be wounded because the less fortunate haven't got that option. The poor are stuck in a world where schools full of kids who don't speak English or have learning disabilities fail to pass standardized tests. You'd think it was an outrage, and that Damon was personally depriving the less fortunate of the opportunity to attend a charter school where they can march around like little soldiers for 200 hours a week. You'd think those schools actually accepted the non-English speakers or the kids with extreme learning disabilities without exception. You'd think that test scores were the only thing that was important, or that rich people sent their kids to schools where tests were all that mattered. Personally, I would not send my kid to a charter school on a bet. Nor would fervent charter supporters Rahm Emanuel, Michael Bloomberg, Joel Klein, Reformy John King, or Barack Obama. In fact, these are the very people that dictate the all tests. all the time. In fact, by closing schools based on test scores, these people deprive Americans of the choice they take as a given--neighborhood schools. These are the same people who have fought the middle class for years. Bloomberg just vetoed a prevailing wage bill. And here's a secret--the one thing that makes a middle class thrive is union. Look at history if you don't believe me. Then take a look at Walmart's history with union. They close entire departments and stores rather than allow it, let alone pay a living wage. Then, ask yourself why the Walmart family spends so many millions of dollars supporting all things reformy. Actually, those of us who support public schools fight so they won't be continually undermined by the very people who have the audacity to attack an actor who agrees with us. If these people wanted to give Americans a choice, they'd give us the choice of government-sponsored health care. They'd give us the choice of union rather than flagrantly defying American law for decades, and getting around it with disingenuous nonsense like Right to Work. We wouldn't tolerate Tea Party thugs taking away the rights of union to collectively bargain. We wouldn't tolerate a wink and nod to a President who promised support for the Employee Free Choice Act and failed to deliver. We wouldn't tolerate a reformy mayor who claims to put Children First, Always by cutting school budgets, terrorizing teachers, and fighting for fewer library services. In fact, the hypocrites are those who spend millions hyping second-tier schools for the poor and don't use them for their own kids. When the poor can send their kids to Sidwell Friends, with less testing and smaller classes, then we can talk. Meanwhile, I've got nothing but respect for those who fight for such options for my kid. 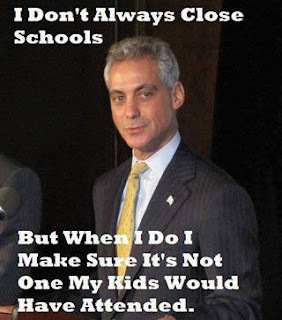 You won't see Rahm Emanuel's children in the charters he deems good enough for other people's kids. And make no mistake, as he closes the schools in their neighborhoods and claims to put children first, he's not doing that at all. He's decimating their communities and ensuring they won't get decent union jobs in the future to save his rich BFFs, folks like the Walmart family, tax money. Matt Damon can do what he wants. As reformy tools of corporations laugh at us behind our backs, deprive us of opportunities Americans fought and died for, and degrade our lives and communities to enrich those who least need it, I'm glad he will speak and fight for us. Those who publicly criticize him are bought and paid for. We don't need their false choices. We don't need their crocodile tears. We don't need their crooked education experts. In fact, we need every single person of prominence who will help reinvigorate the disappearing American middle class. We need a President who will offer more than lip service when the middle class is under attack. And we need every one of our voices raised high against transparently hypocritical nonsense like the criticism of actor Matt Damon.